Is Gyspy’s story compelling during the first season of The Act TV show on Hulu? As we all know, the Nielsen ratings typically play a big role in determining whether a TV shows like The Act is cancelled or renewed for season two. Hulu and other streaming platforms, however, collect their own data. If you’ve been watching this TV series, we’d love to know how you feel about The Act season two episodes. We invite you to rate them for us here. 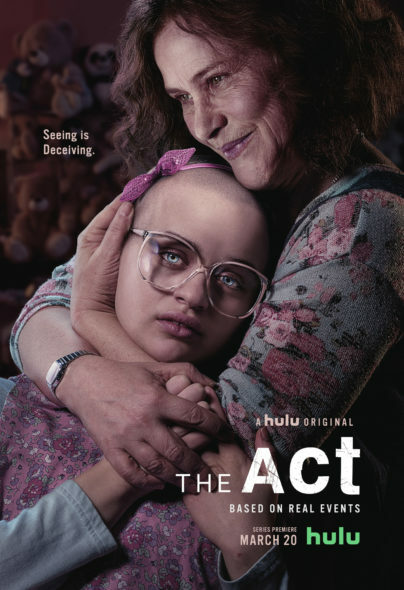 A Hulu seasonal true crime drama anthology, The Act stars comes from creators Nick Antosca and Michelle Dean. The series, and its first season, are inspired by Dean’s Buzzfeed article about Dee Dee and Gypsy Rose Blanchard. Patricia Arquette, Joey King, Chloë Sevigny, AnnaSophia Robb, Calum Worthy, Ginny Cameron, Steve Coulter, and Brayhia Marshall star. In season one, Gypsy (King) appears to be a girl with numerous, serious health problems and the daughter of her devoted mother Dee Dee (Arquette). In reality, their relationship is toxic, and Gypsy is desperate to escape.